We stock official shirts from MGLA, ARKONA (POL), MYSTIFIER, HELHEIM, DEN SAAKALDTE, LIFELOVER, OLD FUNERAL, KAMPFAR, VENOM, TSJUDER, MAYHEM, ANCIENT, NOCTURNAL DEPRESSION, MORK, ROTTING CHRIST, LOITS, SIGH, BLAZE OF PERDITION, BATUSHKA, ABRUPTUM, MASTER'S HAMMER, CULT OF FIRE, VLAD TEPES, MARDUK, FUNERAL MIST, MUTIILATION, EMPEROR, MGLA, DARKTHRONE, FEN, GEHENNA, DEATHSPELL OMEGA, IMMORTAL, BLASPHEMY, ILDJARN, BATHORY, ISENGARD, BAL-SAGOTH, DODHEIMSGARD, BEHERIT, NECROMANTIA, ULVER, MYSTICUM, VULCANO, REVENGE and more. In addition we produce our own exclusive official merchandise. All of our shirts are 100% official and approved and designed with the bands involved. Each item comes with a certificate of authenticity designed by VON founder Venien and declares the number of the artefact. 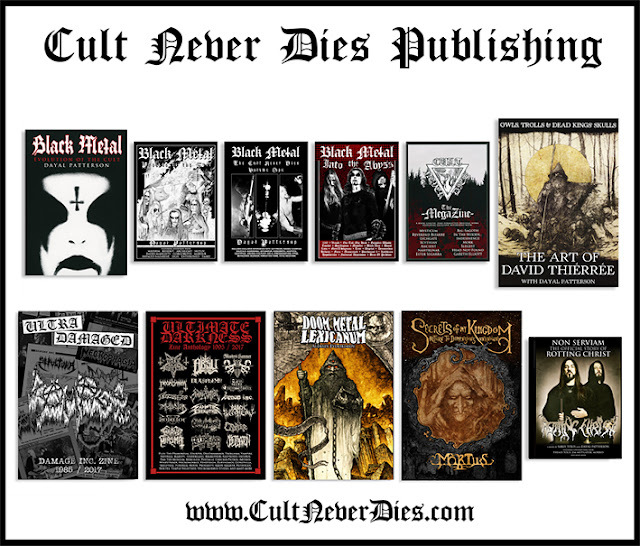 Black metal books, death metal books, doom metal books, underground metal books, black metal fanzines, death metal fanzines, metal photography, black metal shirts, doom metal shirts, black metal hoodies, black metal sweatshirts, black metal longsleeves, official black metal merchandise, official metal merchandise and more.